Writing didn’t come easily. School didn’t either. Reading, however, was my greatest challenge. Letters took on their own shape, and I didn’t see them as my classmates did. For them, jumbled lines named “C” and “A” and “T” somehow flowed together. Other students read aloud, at first sounding things out, but eventually the words rolled off their tongues. I marvelled as they moved from beginner books, slim paperbacks with simple sentences, to chapter books. For me, letters were backwards, flipped around, mirror images. They didn’t assemble into words or stories. My classmates moved on while I was called into an office, then another classroom where they tried to turn the letters around so I saw them as the world did. I was dyslexic. It took three years before words formed on the page, the letters finally going in the right direction. Finally, in third grade, I learned how to read. I can’t remember which book came first, second or third. They were a struggle, each one, and I still couldn’t read aloud without freezing, tears coming to my eyes as the page grew unfocused, the letters terrifying. I didn’t trust my eyes or the words. What if they flipped again? What if I slipped back into my own jumbled world? 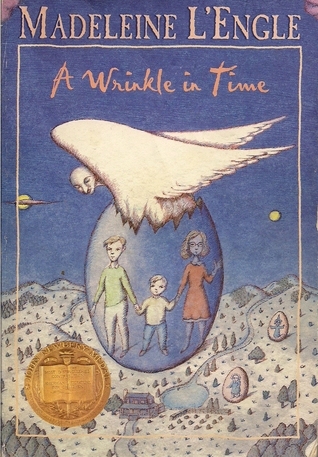 In fourth grade, at the end of the year, I picked up A Wrinkle in Time by Madeleine L’Engle. I worshipped the protagonist, Meg Murry, and her fierce determination. She was smart and courageous, and understood how the universe could contract and expand just as letters once did in my mind. The characters captivated me: Meg’s brilliant and heroic scientist mother, her younger brothers, her crush-worthy classmate Calvin, and their neighbor, Mrs. Whatsit, who first told the family about a tesseract. How could she possibly know about a tesseract, which is what Meg’s scientist father was studying before he inexplicably vanished? I read A Wrinkle in Time through class, ignoring my teacher as she transitioned from the science lesson to math. When she scolded me for ignoring her, I shrank in my chair until I remembered how Meg struggled in school because she was too stubborn and too smart and too rebellious. I emulated her and straightened my back. While my classmates played on the monkey bars, I read my book, transported for the first time to another world–a literary one. When I finished A Wrinkle in Time, and then A Swiftly Tilting Planet, and then the entire Time Quintet, I was a reader. A confident one who could get swept away simply by turning letters into words into sentences into a story. If I hadn’t read Madeleine L’Engle’s books, I wouldn’t be a reader. I doubt I would have gone to college, much less earned an MFA in fiction. As I began writing in earnest, I read about the history of A Wrinkle in Time, and my admiration for Madeleine L’Engle grew. Not only was she masterful at characterization and plot, but she was passionate and persistent. She knew her story had value. She believed in her voice. A Wrinkle in Time was rejected by more than 25 publishers and many questioned the book’s audience: adults or kids? As I worked on my first novel, Tell Me Something Real, I wrestled with similar issues and questions. The book started off as a collection of linked stories, and many were published in literary journals. I didn’t think of writing for children. Honestly, I hadn’t read a young adult book, except for a couple of blockbuster fantasy series. My agent shopped my collection and about 10 editors rejected it. They wanted a novel with a single narrator, not the shifting points of views of my stories. They praised my prose and the premise, but it was as disjointed as my reading once was. As I settled on my narrator, a teenager named Vanessa, my agent suggested I look at publishing it as a young adult novel. While I loved fantasy and science fiction as a reader, I knew my interests as a writer were rooted in the present, in the wonders of everyday life. I read a few contemporary realistic novels: If I Stay by Gayle Forman, Lovely, Dark and Deep (my favorite) by Amy McNamara, and Eleanor and Park by Rainbow Rowell. I found my literary home in young adult fiction. My new novel, Right Where You Left Me, came more easily. I knew how to tell a story. I believed in my voice. My narrator, Charlotte Lang, searched for her missing father, an abducted journalist. She’s quieter than Meg Murry, but equally as determined and she loved her father more than anything. Once again, my love for the Time Quintet grew, and I believe I will always draw inspiration from Madeleine L’Engle as a writer, and the characters who are as real to me as my own.